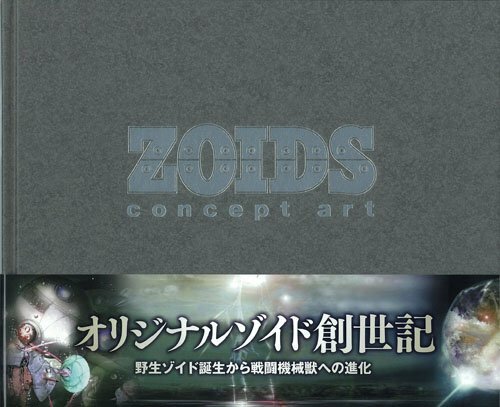 ZOIDS Concept Art is a 96-page hardcover. I was expecting there would be more sketches but it turned out quite different. It's sort of a picture book that also tells the story of the ZOIDS universe. Each page has a large illustration, with captions in both Japanese and English. I like the concept of dinosaur robots, like those that appear in the old cartoon series Transformers. Here, the ZOIDS robots, simply called ZOIDS, are more sophisticated in design. However that sophistication didn't translate well into art in this book. The designs are really cool but the rendering wasn't very nice. There are lots of details in the designs with very interesting shapes but the artistic style doesn't give them the edge details or contrast required. It's very hard to make out the physical form of the ZOIDS as their body parts look meshed together. The ZOIDS at the back of the book, which are not in the splash art, look slightly better. The style of art used in the book look like they have been ran through the "Poster Edges" filter effect from Photoshop software. If you don't know what that is, I'll keep it short: It's not pretty. For the textures, they applied a layer which has the texture like a checkered (square and/or rectangle) board. They are pasted on regardless of surface direction and angle. The texture contradicts the direction of the surface form as a result. And they are applied to everything except the clouds and sky. I'm not impressed with this book. Design and concept are cool but the effects are not nice. So if you're not a ZOIDS fan, you should probably give this a miss. I saw this book at Kino too, and I agree, it's a bit of an acquired taste. The most interesting bit of art for me was in the character sketches at the start of each chapter. But there are only about 4 characters and they were rather small. You'll all be hearing this from a ZOIDS fan i'm here just to clear a couple of things. I think the book is pretty good by the looks of it they look like renditions of the wild zoids before they were completely turned into what they are today in case you guys don't know, in the planet ZI (zoids home world) zoids were and still are to some degree part of the wild life of zi and then humanoids of zi took these zoids and turned them into the giant war machines you have today, now looking at it i'd say that there are a couple of images that resemble some early ZOIDS like the Saber Tiger, Red Horn etc... but they look like unfinished models retaining most of their wild appearance, If that was the goal for this book they've done an excellent job because i've always wanted to see ZOIDS on a more earlier stage before they became the war machines of today, and for one i was actually expecting to look something like that. hey this zoids are concepts not earlier zoids they still are war machines is not part of aa hystory is they are concept zoids that they could have used but did´nt, I see what you tried to do compare the real world of ours and cartoon like prehistoric zoids but there are some alredy zoids are based on real animals and prehistoric animals like saber fang is based on a saber tiger, gojulax, beserk fury, geno breaker are all based on prehistoric animals and so as oder zoids but they all can fitgh. they are earlier zoids than others but you know what I meann for example Murasame Liger is an earlier zoid than the liger zero, by the way the liger type zoids are based on an animal called liger witch is a cross between lion and tiger witch there is a farm in soth africa were they cross these two animals together.